To review complete list click here. North Carolina Senior Tar Heel Legislature Advocacy Day March 15. 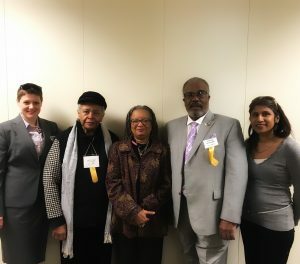 From left to right – Jillian Hardin, Kerr Tar AAA, Sandra Tubbs STHL Delegate (Vance County), NC Senator Angela R. Bryant (Vance and Warren Counties), Charles Jefferson STHL Delegate (Warren County), Suja Jacob, Kerr Tar AAA. If you would like to serve on the NC Senior Tar Heel Legislature please click here to get a Nomination Form. • Provide information to senior citizens on the legislative process and matters being considered by the North Carolina General Assembly. • Promote citizen involvement and advocacy concerning aging issues before the North Carolina General Assembly. • Assess the legislative needs of older citizens by convening a forum modeled after the North Carolina General Assembly. Senior Tar Heel Legislature Delegates and Alternates are sworn in on June 13, 2017. Congratulations to our very own Ms. Sandra Tubbs(Delegate- Vance County), Ms. Annette Meyers(Delegate- Granville County) and Ms. Sue Bryant (Alternate- Granville County).